​This criterion assesses the extent to which the student establishes the scientific context for the work, states a clear and focused research question and uses concepts and techniques appropriate to the Diploma Programme level to design an investigation. Where appropriate, this criterion also assesses awareness of safety, environmental, and ethical considerations. The research questions is clearly stated and precisely formulated. Research question includes clear MV and RV. Research question includes scientific name of organism, if relevant (Genus species). The research question can be used to formulate a hypothesis predicting the relationship between the MV and DV. Hypothesis explanation is scientifically accurate (with correctly cited sources). There should be a single sentence which clearly and specifically states the objective of the investigation (click here to see an example research question). Students must do some thinking to recognize the nature of the problem that has been set, the factors (variables) that will affect the outcome, and how they affect it (the hypothesis). Make sure you select a research question that can be measured using the time, materials and techniques available to you at school! The research question must clearly identify the manipulated and responding variables of the investigation (click here to see an example of variables). If you are using any living organisms, or products from living organisms, such as seeds from a certain plant, give the most precise name you can and give the scientific name if possible (e.g. Phaseolus vulgaris for kidney beans). Although not required by the IB Organization, for many investigations it is appropriate for students to include a hypothesis. A hypothesis is like a prediction. It will often take the form of a proposed relationship between two or more variables that can be tested by experiment: “If X is done, then Y will occur.” Also provide an explanation for the hypothesis. This should be a brief discussion (paragraph form) about the theory or ‘why’ behind the hypothesis and prediction. Be sure the hypothesis is related directly to the research question and that the manipulated and responding variables for the experiment are clear. Click here to see an example hypothesis. The background sets the research question into context. Appropriate and relevant background biology correctly described and explained. Citations relevant to the research question are used. Background information is used to form a hypothesis. Null and alternative hypothesis given if a statistical test of significance is used. ​If relevant, a predicted graph is used to illustrate the hypothesis. Write a paragraph or two explaining why the experiment is appropriate and relevant to the study of biology. How does it relate to what is being learned in class? What process or phenomenon will the experiment support? Click here to see an example background paragraph. MV correctly identified with units and levels, including how the levels were chosen. Minimum of five levels of MV over a suitable range (unless comparing populations or correlating variables without manipulation). RV (as directly recorded and/or calculated) correctly identified with units. Important CV identified, with the potential impact of each discussed. Validity measures and/or control group are not misunderstood as CV. List or photo of apparatus and materials including size, graduation and uncertainty. Reference to preliminary trials, if completed. Method to change and measure MV fully detailed (including tools, units and uncertainty). Sufficient repeats of RV measurement to ensure reliability and allow for statistics (5 for SD, ​10 for T-test, 20+for correlation). Collection of data from other students or sources is explained and referenced. If sampling only a portion of a population, include the method for ensuring the sample was randomly selected. Full citation of a published protocol (or elements of), if used. Consider making a list of materials needed (click here to see an example). Be as specific as possible (example: “50 mL beaker instead of ‘beaker’, type of microscope with magnification range). A diagram or photograph of how the experiment is set up may be appropriate. Be sure the diagram includes a title and any necessary labels. You might have to decide how much of a substance or a solution to use. If so, state your reasoning or show the calculations. 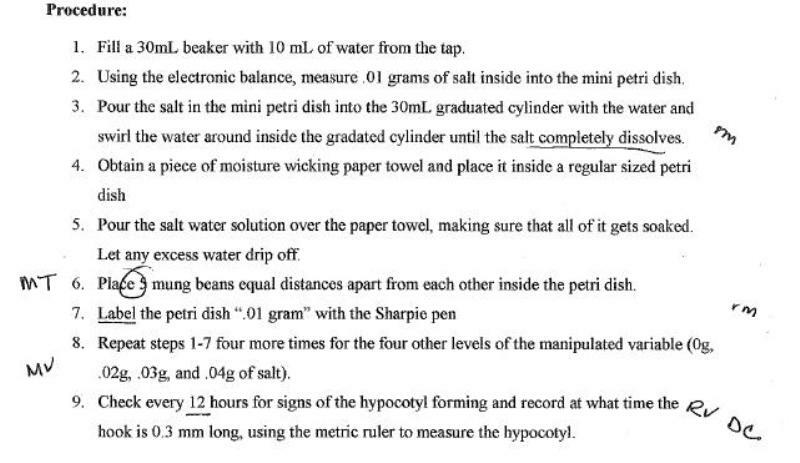 State or discuss the method (procedure) that was used in the experiment (click here to see an example). This can be in the form of a list of step-by-step directions or a narrative. Provide enough detail so that another person could repeat your work by reading the report! You don’t have to go into detail about standard, well-understood actions such as measuring a temperature with a thermometer, weighing out a substance, etc. If a standard technique is used, it should be referenced. 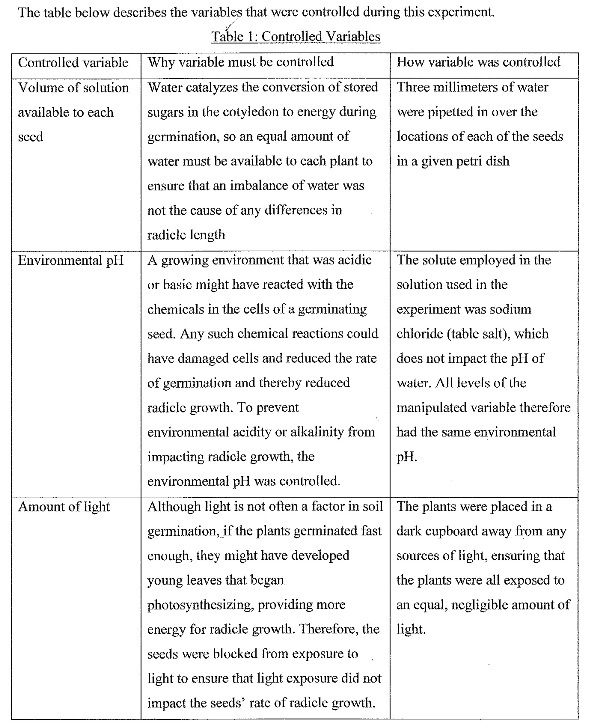 For example, while planning an investigation to study the effect of light wavelength on the rate of photosynthesis in Cabomba, the student may have adapted a method to measure the rate of photosynthesis taken from a textbook. A standard reference would then be expected as a footnote, for example, “Freeland, PW (1985) Problems in Practical Advanced Level Biology, Hodder and Stoughton.” Or the student may adapt a general protocol provided by a teacher in a previous investigation. 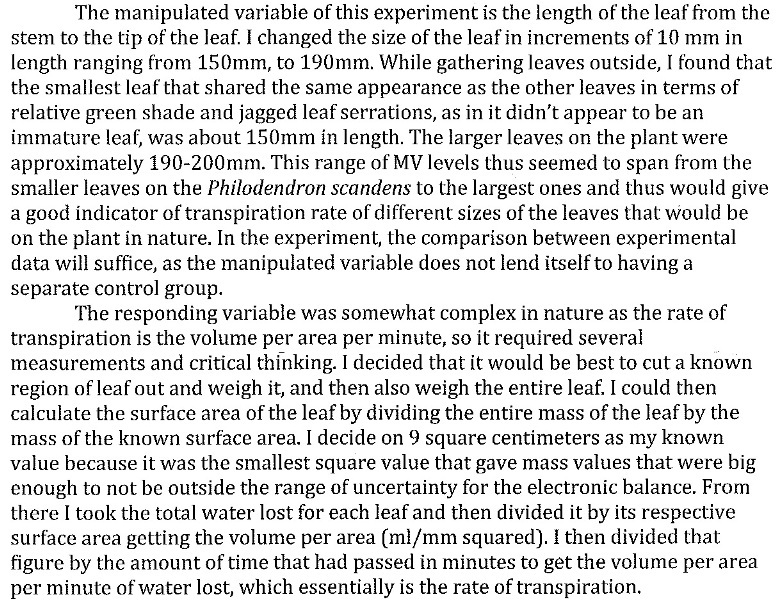 The reference may appear as: von Bargen, G (2017) “Studying the rate of photosynthesis” worksheet. In the method, clearly state how to collect data. What measuring device was used, what data was recorded and when? Or what qualitative observations were looked for (such as color change)? The procedure must allow collection of sufficient relevant data. The planned investigation should anticipate the collection of sufficient data so that the aim or research question can be suitably addressed and an evaluation of the reliability of the data can be made. As a rule, the lower limit is five measurements, or a sample size of five. Very small samples run from 5 to 20, small samples run from 20 to 30, and big samples run from 30 upwards. Obviously, this will vary within the limits of the time available for an investigation. The data range and amount of data in that range are also important. For example, when trying to determine the optimum pH of an enzyme, using a range of pH values between 6 and 8 would be insufficient. Using a range of values between 3 and 10 would be better, but would also be insufficient if only three different pH values were tested in that range. If you are using a known experimental protocol, you must explain how you modified the standard method to make it your own. ​Safety issues fully considered (including human consent forms if needed). Ethical issues fully considered (including animal experimentation policy if needed). Environmental issues fully considered (such as reduction of waste and disposal of chemicals). List any safety precautions that must be taken during the lab, including personal and environmental concerns.